It’s been 25 years since Chandler-Gilbert Community College opened its doors to East Valley students. Since then, CGCC has grown to serving educational needs of over 19,000 students at four locations in the Southeast Valley of the Phoenix metropolitan area - the Pecos Campus in Chandler, the Williams Campus in Mesa, the Sun Lakes Center in Sun Lakes and at the Communiversity in Queen Creek. Students and faculty gathered on October 19 to celebrate the milestone anniversary with a special event at the Williams Campus. Attendees enjoyed free food, music and games. The event wrapped up with an all campus photo commemorating CGCC’s 25 years of service. 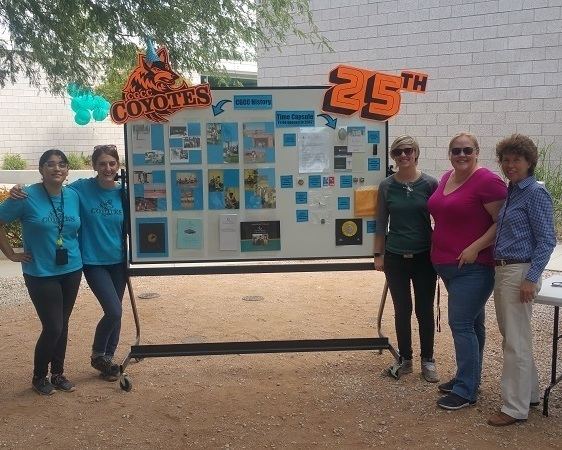 In addition to the on-campus event, CGCC faculty and staff celebrated the 25th anniversary of CGCC’s initial accreditation with a scholarship fundraiser event on October 12. The event raised over $16,000 for student scholarships. Community leaders and business partners came together with early CGCC employees--many now retired--to recognize those who were instrumental in the formative years of the College. Highlights of the evening included presentations by Maricopa County Community College District Chancellor Maria Harper-Marinick, former Chandler Mayor Jerry Brooks, community activist Sue Sossaman, and CGCC President Emerita Maria Hesse. The audience of 200 enjoyed inspiring musical performances by CGCC students and faculty. The 25th Anniversary celebration will continue at the Holiday Breakfast on December 15. After we eat all employees are invited to see a special presentation by past CGCC President Maria Hesse and to join in a group photo on the lawn south of Ironwood Hall. Additional information on this event will be provided in email announcements later in the fall semester.